Every hour. Waiting for Seel Bridge to open. After running all the way up to Norfolk from Sarasota FL it was time to change the oil. Since I never have done that I hired a mechanic from Tidewater Marina to change the oil and filters for the engines and the genset and show me how it is done. Marina mechanics cost more than car mechanics, and It really was easy so next time I will do it. They did it Tuesday morning and we were able to leave to go south at 11:30. We were traveling the Eastern route this time rather than the Dismal Swamp route we took coming up. 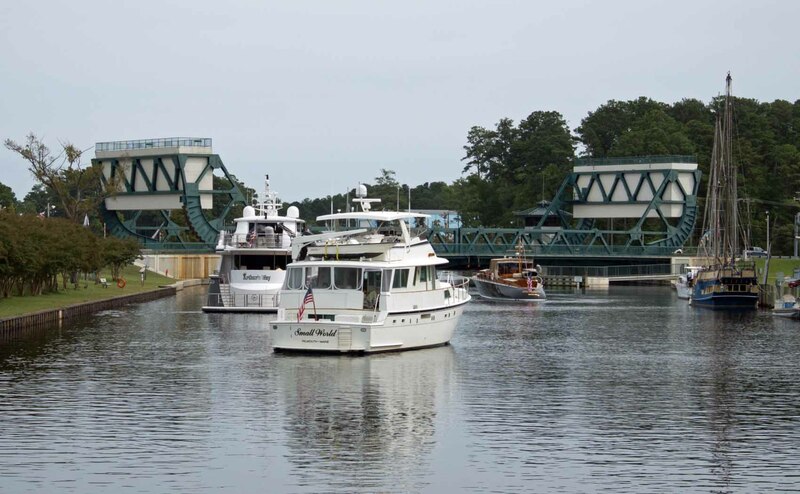 With a late start and 3 drawbridges plus one lock to go through we felt Midway marina at Coinjock NC at mile marker 50 was a doable goal. We might arrive late but could at least arrive before dark at about 8 PM. We actually made it by 5:30. The Norfolk area waterways are filled with bridges of every type and size. We passed one large railroad lift bridge that started to come down immediately after we cleared it. 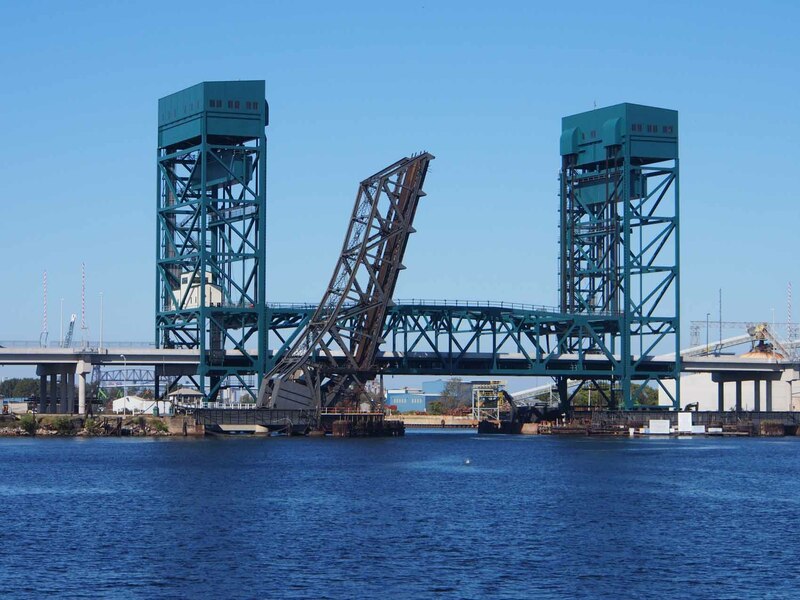 Then within 5 minutes we encountered another railroad lift bridge that was down. Most railroad bridges remain up unless a train is coming, and we had not yet run into any of them down. We never saw a train, but the bridge went up after 10 minutes and we went through. Some Norfolk area bridges. We fit under this lift bridge. The “Steel Bridge” was the first bridge I expected to wait for. It opens every hour and we missed it by 10 minutes so had to wait 50. There was already a boat floating ahead of us and another boat behind us. Two more larger boats came up before the opening. They were faster and asked to go ahead of everyone. I think we are on the leading edge of the “Great Migration” which occurs about mid October as the weather gets colder and everyone heads south. Many have insurance like we do, that does not allow our boat into Florida between June 1 and November 1 because of the likelihood of hurricanes there, so we time our trip to get us to the border at the start of November. Up to now we have been traveling alone most of the time. In a day’s traveling we might pass one or two sailboats going our way and two or three power and sailboats going the other way. We should be seeing more from now on, but I think we are still ahead of most of them. We had intended to stay at Coinjock marina across the canal. It’s just a long face dock along the canal, but it was full, so we ended up at Midway marina. We’re just passing through here, so we’ll get up early and be off.